karate in self-defents and they are very happy this time. I would like to clarify the cow reference. Cows, as well as dogs, goats, small children, wander freely in that part of the world. As my classes in Babuan were conducted in an alley bordered by a cow pen, there was one time, in the middle of a class, that a cow came meandering into our midst. 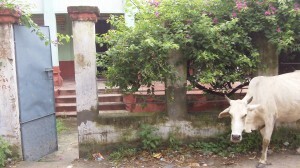 And I shouted at the cow in Hindi, “Only girls! I only teach girls karate! Cow karate is tomorrow!” which everyone thought very funny.